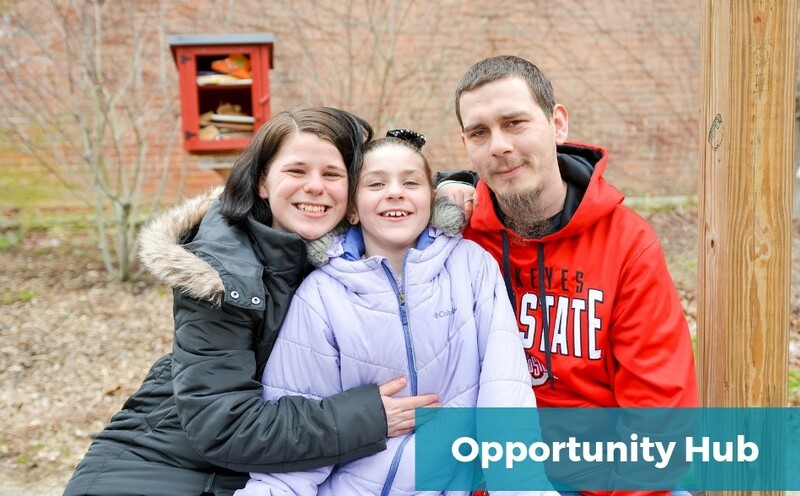 Opportunity Hub invests in the strengths and interests of our neighbors to build family sustainability. The Hub is a place for folks to connect with each other, engage in their interests, and connect with resources. Opportunity Hub partners with families to support and invest in their priorities. Once we are invited into a partnership, we meet with families and talk about their goals, ideas, strengths, and needs. Many families initially engage for emergency support for food and housing and then continue our partnership to navigate resources and advance their goals. Some examples of partnership goals include, finding a job, advancing education, finding a better place to live, engaging in substance abuse treatment, locating childcare supports, and engaging with a community initiative. Families can engage for as long as they want and each family drives the partnership and we invest in their ideas and goals. We believe in people. In traditional models, social service agencies only engage and serve people based on their needs, or what they lack. At the Opportunity Hub, we invest directly in people and engage them based on their strengths, skills, passions, and interests. If you come in for food support through the pantry, we will also ask you about what you are passionate about and engage with your ideas. No appointment needed. Just walk in and engage. Open to all Lower Price Hill residents. For more information, contact us.